Culture Tour With Mt. Everest Flight- 10 days is a moderate trek. Travelers who can walk up to 6-7 hours a day on an uphill and downhill trail will find this trek fulfilling. It is best that we prepare ourselves for the Annapurna trek by jogging and exercising regularly at least a month prior to the start of the trek. Trekking to the Everest Base Camp should be relatively easier for those who have experience walking/trekking in a high altitude environment. Past hiking experience would be an asset but no technical skill is required for this trip. It is also important that we consult our doctor. Participants with pre-existing medical conditions such as heart, lung, and blood diseases should inform Discovery Mountai Trek before booking the trek. The best time to trek to the Culture tour with Mt. Everest Flight is Spring (February to May) and Autumn (September to November). The temperature is moderate in these seasons and guarantees amazing views through the trip. Although this trek can be undertaken during winter, the cold temperature might not be suitable for everyone. Nepal Heritage Tour which includes mountain flight over the Himalayan Range including Mt. Everest. The tour covers all of Nepal’s Heritage Sites which are in the listed by the UNESCO as the World Heritage Site. We start the tour with 1 hour mountain flight over the whole Himalayan Range including the Mt. Everest. The same day, We visit Pashupatinath, Swayambhu, Boudhanath. After end our tour we visit to the two medieval cities famous for their arts and architectures – Bhaktapur and Patan. Then we drive to Chitwan Jungle and discover why the National Park holds an important place in preserving the wild lives that are rapidly getting extinct from this planet and therefore recognized by the UNESCO as a World Heritage Site. From Chitwan, we drive further south-west to Buddha’s birthplace of Lumbini – also a World Heritage Site of the world civilization. After exploring Lumbini, we head to the Lake City of Pokhara – one of world’s most beautiful valleys. Spending another full day in exploring the natural and cultural grandeur of Pokhara, we return back to Kathmandu. You take one hour mountain flight in the morning. Mountain flights are done daily by various domestic airlines, taking-off from Kathmandu airport offering an unparalleled panoramic views of the Himalayas taking you within camera range of the highest peaks in the world. After the mountain flight, we start to visit 3 of UNESCO World Heritage Sites in Kathmandu. Pashupatinath houses a sacred lingum, or the phallic symbol of Lord Shiva. The Aryaghat alongside Pashupati and on the banks of the Bagmati River is a famous site for the Hindus. The Buddhists shrine of Boudhanath is one of the largest stupas in the world, and one of the holiest Buddhist pilgrimage and tourist destinations in Kathmandu. The area of Boudhnath is also famous for over 45 Tibetan Gompas or monasteries. Swayambhu meaning the “the self-existent” is popular among the foreigners as the Monkey Temple owing to the large number of monkey population residing in the area. After breakfast we drive to Chitwan, 150km from Kathmandu and a 5 to 6 hours drive into the mountains and hills . All the way we descend down along the winding road on the banks of the Trishuli River. After reaching at Chitawan and getting refreshed you will be briefed about full programs by our guide. Then we start for ours activities. There will be a guided village walk and a walk on the banks of the Rapti River to watch the sunset views in the sub-tropical jungle. In the evening, dinner with cultural program. The Chitwan National Park has been declared by the UNESCO as a World Heritage Site. Today you will discover why the National Park holds an important place in preserving the wild lives that are rapidly getting extinct from this planet. You’re almost sure to spot water buffalo, egrets, woodpecker, and deer in their natural habitat. The Park is also home to rhinoceros, tigers, leopards, sloth bears, wild bison, gangetic dolphin, 500 birds, butterflies, as well as the near extinct Gharials crocodiles. You can do a number of activities here – an elephant safari, a nature walk, bird watching, a jungle drive or a canoe trip. You can even take a bath with an elephant. We start after breakfast to bird watching then we drive to Lumbini another World Heritage Site 180km from Chitwan and a 4 to 5 hours drive further south-west. Lumbini is most important Buddhist pilgrimage site the place where Buddha was born, it is also an important architectural and historical site of the world civilization. we explore some of the major landmarks and monuments in Lumbini such as: Mayadevi Temple the exact site where Buddha was born, Ashoka’s Pillar, erected by Emperor Ashoka 249 BC, and various other temples and monasteries founded by the devotees from different countries like, Tibetan, Chinese, Japanese, Korean, Thailand and more. We drive from Lumbini to Pokhara the distance is about 285km north-east which takes for about 7 hours. The drive is very much on the same road we came by till we reach Mugling. From Mugling, we drive further west into the mountains, following the rivers for much of the day. Pokhara, one of the most beautiful places on earth. 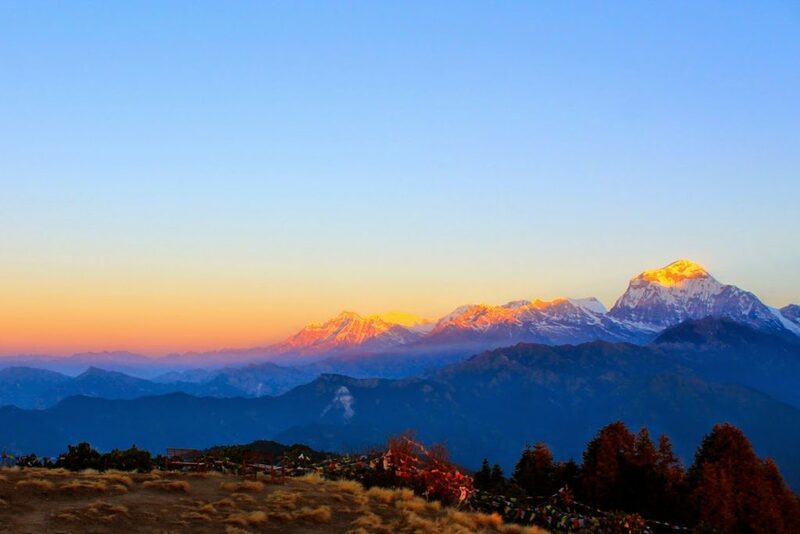 The town offers magnificent views of Dhaulagiri, Manaslu, Machhapuchhare, Annapurna and many more. Pokhara is also the gateway for trekking in the Annapurna Region. After arriving Pokhara, we go for a sightseeing, marketplaces, old bazaars, and landmarks and In the evening we explore the surrounding lakeside. Early morning we drive to the Sarangkot Hill to have the excellent sunrise views over the Himalayas. We come back to hotel for breakfast then we start a full day sightseeing of Pokhara. Enjoy walking along the bank of Phewa Lake, admiring the stunning reflection of the Fish Tail Peak in the blue Phewa Lake. We also take a boat around the Phewa Lake which is the second biggest lake of Nepal. We take the boat across the lake and take an hour’s walk to the World Peace Pagoda. And we also visit to the Gupteshwar Cave, Seti River Gorge, Devi’s Fall and the mountain museum etc. We start our drive to Kathmandu the distance about 210km it takes 6 to 7 hours. Better to hold on the left pane of the vehicle to enjoy the scenery through the route. Upon arrival in Kathmandu, you will be transferred to your hotel. We start our tour of two more UNESCO World Heritage Site cities adjacent to Kathmandu: Bhaktapur and Patan. The medieval town of Bhaktapur, or the Town of the Devotees, preserves medieval arts, architecture, culture, and lifestyle to this date. One is sure to feel like travelling back into the past while walking along the Bhaktapur thoroughfares, squares and streets. Patan is also known as The City of Fine Arts, Patan Durbar Square is one of the places in the Kathmandu Valley where the medieval arts and architecture still remain in its original state. The Durbar Square is full of ancient places, temples and shrines, noted for their exquisite carvings, mostly the Hindu and Buddhist monuments. Saying good bye to the mountains as your tour in Nepal comes to an end today. We hope you enjoyed the tour with us, and we are sure you will be back for a trip to the Himalaya again. Discovery Mountain Trek drop you at airport a few hours before the scheduled flight. very good culture trek really touched my heart. Nepalese culture and panoramic view makes us attractive.